Basic Adobe CQ5 Interview Questions -Here is a list of Adobe CQ5 interview questions and answers for beginners to help you in cracking interviews which many of my friend faced, in their technical round. I have also read many forum and sites to consolidate all important adobe CQ5 Interview Questions also known as AEM(Adobe Experience Manager). Adobe CQ5(also known as Adobe Experience Manager) is a java based content management system from adobe. It is based on a content repository to store the content of a website and use JCR(java content repository) specification to access the content repository. It uses powerful OSGi framework internally to allow modular application development. It means individual pieces of your application(called bundles in terms of OSGi) can be independently started and stopped. 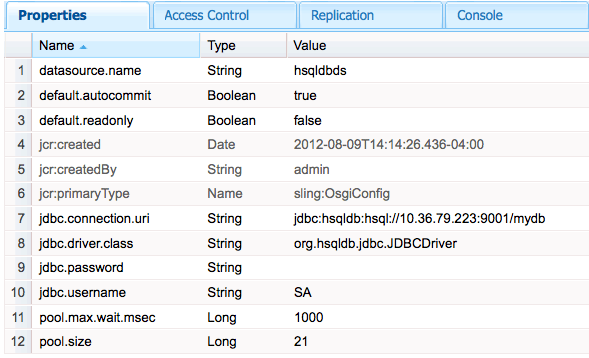 It uses Apache Felix as the OSGi container. Therefore different parts of cq5 can be independently started and stopped. JCR – Java specification for accessing a content repository JSR-283 specification jcr 2.0 , cq5 uses its own implementation of jcr called CRX. Apache Jackrabbit is an open-source implementation of jcr 2.0 specification. OSGi(Apache Felix) – Framework for modular application development using java. Each module called bundle can be independently started and stopped.OSGi container which provides implemention classes for OSGi framework. Explain Architecture of CQ5 application ? Learn CQ application project structure in detail. What is Adobe marketing cloud ? Why do i need it ? Basically it is a collection of 8 adobe marketing solutions, it helps customers to master digital marketing by leveraging these adobe marketing solutions. Adobe Experience Manager- helps customer to create a seamless digital appearance, across all platforms and languages. That helps customers to build there brand globally and increase there demand. Adobe Social – helps customers to lead in there social media channels like Facebook,twitter,google plus and enables customers to know its community sentiments. Adobe Analytics – like google analytics it also collects , analyze and divides visitors into segments that can be plotted on charts to get better understanding and insight about your visitors. Adobe Target – It uses Adobe Analytics inputs to deliver targeted or most relevant content to right visitor and right time. It understand customer preferences provides personalized experience to meet each customer need instantly and hence increases overall sale. Adobe Media Optimizer – It allows customers to provided targeted ads to the visitors and hence optimize overall money spent on ads. Adobe Campaign – It allows customers to provided targeted one to one campaigns to the visitors based on their interest. Adobe Primetime – Primetime helps you to create, deliver and monetise personal video experiences. Adobe Social – Social helps you to create relevant social content and quantify your social marketing results. The global.jsp script which adobe provides by default declares Sling,AEM and JSTL taglibs to make component creation easy in AEM. Which script you should include to display sidekick ? @Component – defines the class as a component. @Service – defines the service interface that is provided by the component. @Reference – injects a service into the component. @Property – defines a property that can be used in the class. What is Multi Site Manager (MSM) in AEM ? How to configure MSM in AEM ? What do you mean by Live copy and blueprints in AEM ? How to create Live copies and blueprints ? Have you worked on workflow model in AEM or CQ? Can you tell me how i can execute a workflow and what are the steps involved in it? Yes i have worked on workflow in aem. Design dialog data is stored under /etc/designs folder. To put multiple files we can use many tools that supports WebDav Protocol Like NetDrive. Learn how to use WebDav in Details. What are the different interfaces available in AEM ? How do you resolve a resource ? You can resolve using ResourceResolver which you can get from method getResourceResolver() and then use resolve() method to resolve a resource. How do you adapt a resource ? You can adapt a resource to any anothor type using adaptTo() method, which accepts class type in which you want to adapt your resource. It is used for adding site specific js and css files to the page and also thridparty js and css files. jcr:primaryType of clientlibs folder is cq:ClientLibraryFolder. It takes cares of dependency management, merging files and minification of all js and css files stored under it. How resource resolution is done in Apache Sling? 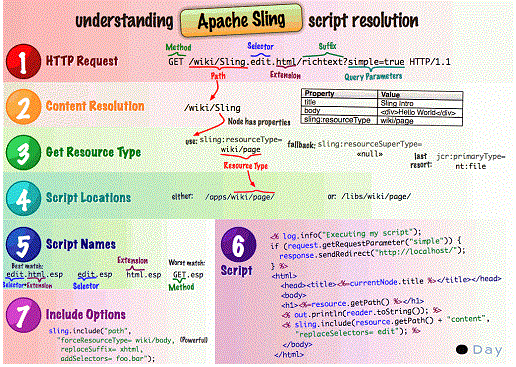 How a URL is resolved and mapped to a resource by Apache sling is described in below image. The mapping uses the content path extracted from the request to locate the resource. 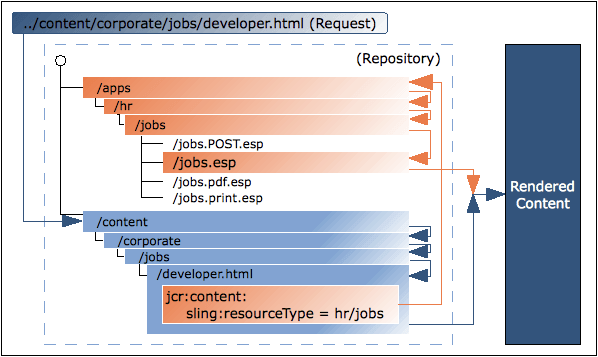 When the appropriate resource is located, the sling resource type is extracted, and used to locate the script to be used for rendering the content. Relative, to a configuration parameter. Note: If there are multiple cq instances configured with a dispatcher, the dispatcher can do a load-balancing and if there is too much load on any cq instance, it can relay the request to another less busy instance. Explain significance of different folders used in CRX repository ? /apps New Project is created here and all custom code goes under it. What are the steps for creating custom components in cq? Steps for creating a custom component in detail. Explain life cycle of OSGI[Open Systems Gateway initiative] bundle? OSGi is a framework which allows modular development of applications using java. A large application can be constructed using small reusable components(called bundles in terms of OSGi) each of which can be independently started, stopped, and also can be configured dynamically while running without requiring a restart. Reduces the complexity of the system. What are the differences between Parbase and parsys? Below are the differences between Parbase and Parsys. It allows components to inherit attributes from other components, similar to subclasses in object oriented languages such as Java, C++, and so on. For example, when you open the/libs/foundation/components/text node in the CRXDE Lite, you see that it has a property named sling:resourceSuperType, which references the parbase component. The parbase here defines tree scripts to render images, titles, and so on, so that all components subclassed from this parbase can use this script. The parbase component is never used explicitly, but only facilitates the rendering of a component when added in the Parsys. If we are creating any new xtype and we want it to be draggable then we give its sling:resourceType as parbase. Users do not need access to the parbase. The paragraph system (parsys) is a compound component that allows authors to add components of different types to a page and contains all other paragraph components. Each paragraph type is represented as a component. The paragraph system itself is also a component, which contains the other paragraph components. 41 Responses to "Adobe AEM CQ5 Interview Questions and Answers for Beginners"
Looking for a trainer in Adobe AEM , please reach me if you are interested. Kindly reach out to me on my email ID for any kind of Day CQ training. I am looking for trainer. Please let me know in case you are available to train. I am looking for basic AEM training for a Business Analyst prespective. Please advise if you assist ? Did you get an answer as i’m also a BA looking for Basic AEM training from a BA perspective. Looking for AEM training please reach me. yes.I am looking for trainer.Please Help. Hi I need AEM training will you please train me ? I am a graphic designer. Just want to know that will this tool related to my profile or not? No, it is a content management tool. Sling models are pure POJO, which are automatically mapped from sling object in our CRXDE to Resource or Request Object, using simple annotations like @ modal for POJO class and @inject for data members. what is the use of resolve resource? Sorry for the typo error…awaiting for your response I really wanna learn this. Hello, Can you please help me with below scenario? Note: Its not single paragraph where we can add few properties to disable p tags, need to create multiple paragraphs. Please let me know if anyone knows what i’m talking about. Have good knowledge on AEM, but no project to work on. Any live experience training’s suggestions please. I am a Java developer having 3.5 years of experience in Java/J2EE web development.In our project we are using Alfresco content manager. I dont know AEM but I want to learn it minutely and attend an interview for the same. Can you please suggest whether it can be helpful for my career and which study materials or site I need to follow for getting practical knowledge for the same. Contact me if you are looking trainer for below technologies. Trainers are available for below technologies . Written in a very simple and composed manner. Training myself for an interview after 8 months of gap from CQ5 . helped a lot . Thank you and keep up the good work. please tell me the exact difference betwen i18n and MSM ? i18n is used for translation of selected fields/properties based on sling:key and sling:message. whereas MSM allows you to view and manage your blueprint and its live copies, during rollout you can use translation services to translate the page based on its locale automatically. IN MSM your entire page is translated using third party translator services where as we use i18n when we have selected field which we need to translate like First Name etc..
can you tell me how flow goes once we create a template or component in AEM?